Namaste signs binding terms sheet to acquire UK-based licensed pharmaceutical distribution company AF Trading Ltd.
Namaste Technologies Inc. (TSXV: N) (FRANKFURT: M5BQ) (OTCMKTS: NXTTF) is pleased to announce that the Company’s wholly-owned subsidiary, Namaste Bahamas Inc. (“Namaste Bahamas”), has signed a Binding Terms Sheet (“Terms Sheet”) to acquire all of the issued and outstanding shares of UK-Based AF Trading Ltd. (operating as “Access Fulfillment” or “accessfulfilment.com”). Access Fulfillment operates a 30,000 square-foot distribution facility in the UK and holds a Wholesale Distribution Authorization (Human) License issued by the Medicines and Healthcare Products Regulatory Agency (“MHRA”) which allows Access Fulfillment to distribute pharmaceutical products throughout the UK. The acquisition of Access Fulfillment is the first step in Namaste developing its future medical cannabis distribution platform in the UK, which represents a much larger customer base than that of its Canadian operations. The Company intends to launch a platform similar to its Canadian wholly-owned subsidiary Cannmart Inc. (“Cannmart”) within the UK market to help monetize on its database of over 500,000 customers. Prior to July 2018, the UK prohibited the use of medical cannabis. Since that time, the UK Home Secretary has announced that licensed clinicians will now be able to legally prescribe cannabis-derived medicines to patients, as an alternative to prescription drugs. As medical cannabis legalization in the UK progresses, Namaste believes this acquisition will provide the Company with the first-mover advantage in the UK market, which will enable them to implement a fully integrated platform and sales funnel based on Namaste’s current Cannmart business model. Namaste is focused on creating the largest global platform for everything cannabis and in developing innovative technology. The acquisition of Access Fulfillment and its license with MHRA provides Namaste with the necessary infrastructure to capitalize on a market where it maintains a strong market presence. Namaste will acquire all issued and outstanding shares of Access Fulfillment for US $5 million. Payment to Access Fulfillment will be 50% in cash and 50% in Namaste common stock shares. No capital raise will be required. Access Fulfillment’s management will sign consulting agreements for operations and business development. Access Fulfillment’s management will sign non-compete agreements. Access Fulfillment will operate as Namaste’s exclusive distribution center for CBD and cannabis products in the UK. The acquisition of Access Fulfillment will be subject to approval by the Toronto Venture Exchange (“TSXV” or the “Exchange”). Both parties will have 30 days to complete and sign definitive documents required to complete the transaction. Namaste has been selling cannabis ancillary products in the UK for over 4 years and maintains a database of over 500,000 consumers during which period Access Fulfillment has undertaken all distribution of cannabis vaporizers and accessories on behalf of Namaste. Through the acquisition, Namaste anticipates a significant reduction of its costs as related to fulfillment of its vaporizer and accessories in the UK and EU markets. The Company maintains a strong working relationship with Access Fulfillment’s management team and believes the launch of cannabis sales through the distribution center represents a high growth opportunity, subject to approval by the MHRA. The Company plans to submit its revolutionary telemedicine application and patient acquisition tool, NamasteMD (“NamasteMD” or “NamasteMD.com”) to the Apple and Google Play stores, which will allow Namaste to leverage its telemedicine application to acquire medical patients through online consultations in the UK. 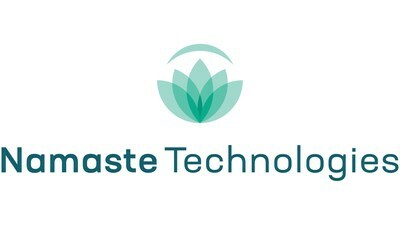 By acquiring Access Fulfillment, launching NamasteMD and developing supply relationships with domestic cultivators, Namaste will have the infrastructure it needs to launch CBD and cannabis products into its marketplace in the UK, subject to approval by MHRA and other any applicable regulatory bodies. Namaste has established itself as a global leader in cannabis e-commerce and technology. The company has incorporated revolutionary technology platforms like NamasteMD as well as its proprietary machine learning applications through the Company’s wholly-owned subsidiary, Findify AB (“Findify.io”). The Company recently launched the first AI-driven cannabis journaling app, My Uppy Cannabis Journal (“My Uppy”), which is available internationally through the Apple store and on Android devices. These platforms allow Namaste to create a highly personalized experience for every user which helps optimize conversion rates and increase revenue. By acquiring Access Fulfillment, Namaste will enter into a market much larger than Canada, where it maintains a history of customer service excellence, strong revenue and brand loyalty. Additionally, having the ability to acquire patients through a telemedicine app and distribute cannabis products through Access Fulfillment’s facility represents a unique opportunity to leverage a significant market. With access to over 500,000 users in its UK database, the Company is well positioned as a global platform for all things cannabis. Further to the announcement related to the Terms Sheet, Namaste would like to announce the success of its Shareholder Pledge Party (the “Pledge Party”), which brought together over 800 investors and 200 media influencers at New City Gas in Montreal the night of Wednesday September 12th, 2018. The event, which was for Company shareholders who participated in a voluntary 90-day pledge to hold their shares was an incredible success. The Pledge Party was the first party of its kind and featured celebrity performances and Namaste’s various strategic partners who sponsored the event. Namaste would like to take the opportunity to thank its sponsors and reinforce its position with each partner, who had the opportunity to speak to shareholders and the media as outlined below. On August 22nd, 2018, Namaste signed a supply agreement with Manitoba-based ACMPR Licensed producer, Bonify Inc. (“Bonify”). Under the terms of the Supply Agreement, Namaste will purchase bulk cannabis products through Cannmart. Bonify operates a large-scale cultivation facility and will expand capacity to over 350,000 square-foot to help accommodate Namaste’s growth trajectory. Namaste will work with Bonify to develop private-label strains of cannabis for the medical and recreational markets as well as in offering the full selection of Bonify products. Bonify will be a strong supply partner for Namaste as they understand the Company’s vision and have significant capacity to support Namaste’s growing patient network. The Agreement with Bonify will ensure supply availability for Namaste during a period going into recreational legalization where many producers anticipate a supply shortage. On May 23rd, 2018, the Company signed a definitive agreement with Inolife R&D Inc. (“Inolife”), whereby Namaste was granted exclusive rights to the commercialization of Inolife’s innovative needle-free technology for applications of medical cannabis, in accordance with Health Canada regulations. Namaste intends to produce medical cannabis oil through its partnership with Infinite Labz Inc. (“Infinite Labz”) and to specifically formulate oil for use with Inolife’s injector technology. The Company believes that needle-free injection of cannabis oils could prove to be one of the most effective means of dosing through a painless device, with a fast absorption rate. Namaste will work with Inolife’s management team to develop standardized production procedures for oil production, and for testing or studies required to commercialize the technology for applications of medical cannabis in accordance with federal regulations. On July 18th, 2018, Namaste signed an e-commerce and technology services agreement with BlissCo Cannabis Corp Inc. (“BlissCo”) (CNSX: BLIS) (FRA: GQ4B:GR), whereby Namaste will provide services including access to Namaste’s technology platforms, software integrations and e-commerce services, including those powered by Namaste’s e-commerce artificial intelligence (AI) platform, Findify.io. Under the terms of this Agreement, Namaste will leverage its proprietary technology platforms to develop an innovative online marketplace in partnership with BlissCo to enhance BlissCo’s patient experience. BlissCo is a Canadian licensed producer and distributor of high-quality medical cannabis that operates an Access to Cannabis for Medical Purposes Regulations (“ACMPR”) cultivation facility based in Langley, BC. On June 13th, 2018, Namaste signed a Subscription Agreement to acquire 15% of the share capital of Pineapple Express Delivery Inc. (“Pineapple Express”) for CAD $1,000,000. Pineapple Express has secured a Courier Services Agreement with Ample Organics, Canada’s leading seed-to-sale software platform, for same-day cannabis delivery. Pineapple Express has developed a same-day delivery service for medical cannabis and expects to expand across Canada. Pineapple Express’ management team have a proven track record of launching cross-country same-day delivery services, having sold a previous same-day delivery venture to Just Eat Canada. Namaste will integrate Pineapple Express into its platform with Cannmart offer another added value service for its patients. On June 27th, 2018, Namaste signed a Master Services Agreement with YPB Group Ltd. (“YPB”)(ASX: YPB), an Australian based product verification and customer engagement company. Namaste has identified the need for its global customers to have confidence in the products they are purchasing, and for vendors to have access to granular data on their end-users. As such, Namaste plans to introduce YPB’s solutions across its network of manufacturers and to Canadian Licensed Producers to bring certainty of authenticity and supply chain transparency to the entire legal cannabis industry globally. This coalition furthers Namaste’s agenda in providing leading technology platforms for its global marketplace and in enhancing the user’s experience for its customers. On May 18th, 2018, Namaste signed an exclusive international distribution agreement with Shatterizer Inc. (“Shatterizer” or “Shatterizer.com”), whereby Namaste will retain exclusive rights to sell Shatterizer’s innovative line of cannabis concentrate vaporizers in international markets. Namaste is also pleased to announce that the Company will be working with Shatterizer to launch a pod-based vaporizer system for the Canadian recreational market. The Company, through its wholly-owned subsidiary Infinite Labz Inc. (“Infinite Labz”), will produce cannabis oil and provide filling and distribution for Shatterizer’s upcoming pod-based concentrate vaporizer system. Namaste is focused on leveraging its expertise in vaporizer technology within Canada, in an attempt to capitalize on what it anticipates being a significant market for concentrate pens and pre-filled cartridges in both the recreational and medical cannabis markets. Famous Brandz represents several celebrity brands of smoking products including Cheech & Chong: Up In Smoke, Trailer Park Boys, Jay and Silent Bob, and Snoop Dogg’s exclusive glass line – SNOOP POUNDS. Namaste maintains a strong relationship with Famous Brandz as it offers its unique offering of high quality smoking accessories. Strong brands and collaborations are at the core of Famous Brandz business. Its founders have over 20 years of experience in the smoking accessories industry and have come together to deliver the strongest and most well-known brands to the market. Working with top celebrities and film studios, Famous Brandz offers the largest array of mainstream smoking products. Sean Dollinger, President and CEO of Namaste comments: “We are very pleased to announce the Terms sheet with Access Fulfillment, which represents a very strategic transaction for Namaste in expanding Cannmart’s model into our international markets. We’ve worked with Access Fulfillment for many years and have the utmost confidence in their operation and management team. We’re looking forward to securing supply agreements in the UK and in eventually facilitating the import of medical cannabis products into the UK market through Access Fulfillments’ facility. We’ve done business in the UK for many years and our UK assets including Everyonedoesit.co.uk and NamasteVapes.co.uk maintain strong brand loyalty and drive significant revenue. By acquiring Access Fulfillment, we will leverage our technology and user base to introduce medical cannabis sales within our platform subject to further progress on UK’s cannabis legalization.